Any fertile soil with good drainage and an alkaline or near-neutral pH. Moderate. Young seedlings often escape damage from light frost, but may be injured by sudden freezes. Perennial forms are winter hardy. Mix a light application of a balanced organic fertiliser into the soil prior to planting. In early summer, drench plants with a liquid feed to support strong growth. Phlox. The light, airy blossoms of baby’s breath go with everything, but are best located along the edges of flowerbeds for easy cutting. Start seeds indoors in late winter and set out the seedlings while the soil is still cool. Or, sow seeds where you want the plants to grow in early spring, as soon as the soil can be worked. Perennial forms of baby’s breath are invasive in many climates, but this is not an issue with annual baby’s breath (Gypsophila elegans). Cut stems for flower arrangements when half of the flowers are open. 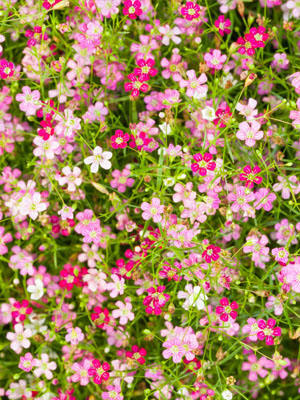 Excessive rain can cause baby’s breath to develop root rot problems.